Do you ever look at the price tag on a piece of clothing and think, I could sew that myself? Well, sew do we! Sewing your own clothes is rewarding and cost-effective, plus it's an enjoyable creative skill to develop. Sewing Knits from Fit to Finish gives you the instruction you need to sew soft knit fabrics using professional techniques. 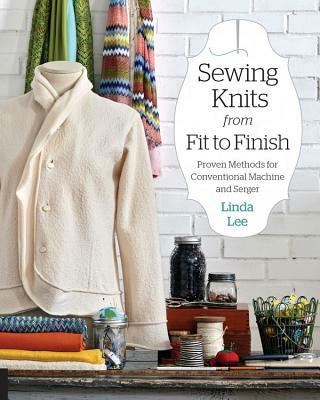 This comprehensive reference book from expert Linda Lee includes methods for both conventional sewing machines and sergers, and it includes precise construction notes and how-to photos along the way. Imagine an updated wardrobe that you have total control over. Sewing Knits from Fit to Finish makes that dream a very possible reality. Not only that, the book reveals a few shortcuts and troubleshooting tips to ensure a stress-free sewing process. So jump on the sewing bandwagon! Once you learn how to sew knit-fabric pieces, you'll wonder why you ever bought them. Linda Lee is the owner of the Sewing Workshop Pattern Collection, a group of patterns for distinctive garments using innovative sewing techniques. Linda writes for Threads, Sew News, and Stitch magazines and is the instructor for seven online classes for Craftsy.com. She travels the country teaching fine sewing techniques and the art of combining beautiful fabrics and distinctive design in garment and home decorating creations. Using her background as a licensed interior designer and a member of ASID since 1974, she has written fourteen books relating to garment sewing and interiors. Sew Sensational Pillows won the Independent Book Award in the Craft and Hobby category and Sew Easy won honorable mention by the Independent Publisher Book Awards for Most Original Design in their Ten Outstanding Books of the Year awards. Everything you need to know to achieve beautiful results when sewing knits...Anyone who sews will turn to it again and again.